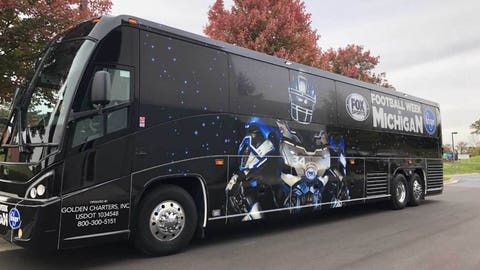 SOUTHFIELD, Mich. — FOX Sports Detroit today announced it will launch the Football Week in Michigan Bus Tour –– a series of events spanning from Marquette to Metro Detroit — beginning Sunday. The network’s Football Week in Michigan Bus Tour will travel around the state in a specially designed Football Week in Michigan bus making stops to host mini-tailgates at Kroger stores or local establishments. The tour will also feature a series of community-driven stops to support Kroger’s Zero Hunger, Zero Waste initiative. The tour is in promotion of FOX Sports Detroit’s Football Week in Michigan, a landmark initiative highlighting high school championship and all-star games, as well as college and professional gridiron action over a nine-day span. Football Week in Michigan is presented by Kroger. Moore was the Lions’ first-round draft pick in 1991. He went on to shatter virtually all of Detroit’s receiving records during 11 seasons (1991-2001) with the Lions. His storied football career features numerous accomplishments, including the distinct honor of being the only Lions receiver to make more than 100 receptions in three consecutive seasons. He has also worked as an NFL analyst for pregame and postgame coverage for the past 15 years. Martin, the head coach for Team Legacy in the 2018 All-Star Game, played for the Wolverines from 2008 to 2011. At Michigan, he recorded 172 tackles and appeared in 49 games, including 37 games as the Wolverines’ starting nose tackle. He was selected as a second-team All-Big Ten Conference player by both the coaches and media in 2011 and 2010. Martin was selected by the Tennessee Titans in the third round of the 2012 NFL Draft. Jones, the head coach for Team Legends in the 2018 All-Star Game, played for the Spartans and was a two-time All-American. The New York Giants selected him in the sixth round of the 2011 NFL Draft, and he was a member of the Giants’ Super Bowl championship team in 2012. He also played for the NFL’s Jacksonville Jaguars and Tennessee Titans. Kroger will also be making $1,000 donations in gift cards to eight different schools, food banks and kitchens on the tour. Coverage of Football Week in Michigan, presented by Kroger, kicks off Nov. 17 and continues through Nov. 25 with 19 games airing across FOX Sports Networks. The schedule features a feast of action, including Detroit Lions vs Carolina Panthers. For a complete schedule of games during Football Week in Michigan, visit foxsportsdetroit.com.